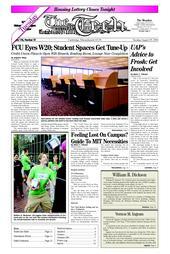 Plans are underway for the MIT Federal Credit Union to open a branch on the first floor of the Student Center. This comes as the newly-renovated reading room opens for student use and the project to convert the former Cashier’s Office into a student lounge nears completion. The Credit Union submitted a letter of intent to occupy space on the first floor to the MIT Real Estate Office, said Phillip J. Walsh, director of the Campus Activities Complex. While no dates have been set since legal processes must still be completed, the project will most likely move forward. The Credit Union branch would occupy about 60 percent of the existing game room facility, Walsh said. The bank is currently working with architects. According to Walsh, activity in the game room has been decreasing for a number of years, even after the games were moved from their previous location in the basement to the first floor of the Student Center. At the same time, the vendor who provides the games has indicated his intention to “slowly move out of the business,” Walsh said. The current plan is to maintain a smaller game room with the most popular and profitable games, including Dance Dance Revolution. The space will also continue to maintain seating, Walsh said. “The Credit Union has missed being on campus, and the campus has missed us,” Credit Union CEO Brian W. Ducharme said. The Credit Union moved from Building E19 to its current Technology Square location in July 2004. According to Ducharme, the Credit Union will maintain its office in Tech Square. The concept of the Student Center branch will be progressive, with “more sophisticated machines, not the traditional teller line.” He said that he hopes this will better meet the community’s needs. The new branch will continue the Credit Union’s no cash model. Walsh said that he feels this arrangement will be good for students who will have more choices in banking services with both Bank of America and Credit Union branches in the Student Center. Undergraduate Association President Andrew T. Lukmann ’07 plans to send out a statement in the coming weeks about the possible game room changes to gauge student reactions. The reading room, located on the fifth floor of the Student Center, will be open for freshmen tours on Thursday and for the Student Center Open House on Friday. Students will be able to use the 24-hour-access space starting this week. The free lockers to be located near the entrance of the room for convenient storage still need to be inserted, Walsh said. The CAC is also considering adding art to the room. “I am very pleased with the reading room,” Lukmann said, noting in particular how much brighter the room is now. One goal of the renovation was to provide better lighting. The renovations divided the room into three different study environments: a lounge, an individual study area, and a group study area. The majority of the space was reserved for individual study, with tables that can be converted into desks with carrels. Seven work rooms make up the new group study space and include LCD panels and white boards for presentations. The architectural plans by Signer Harris Architects were finalized in late April with a final review by the CAC Advisory Board, as reported by The Tech in June. The approved budget total for the project is slightly below $1.2 million. In all, the renovation took approximately eight weeks on what was a 12-week project, said Walsh. A ceremony celebration the completion of the renovation will be held during the second week of September. The student lounge along the Infinite Corridor will also be opening within the next two weeks. To celebrate the completion of the space, recently named the Community Lounge, another ceremony is planned for the middle of September, a few days after the ceremony for the reading room. The CAC and the UA have plans to bring together a committee of interested students to attract student artists, Lukmann said. “We’re certainly not planning to leave it that blank.” The group will likely be brought together in late September or early October, Walsh said. Whether the exhibits will be permanent or rotating will need to be decided by the student committee. This committee may be the same group that will work on the renovation of Pritchett Dining Hall, which the CAC would also like to add art to, according to Lukmann. Additionally, detailed reproductions of the Dollar Bill Mural may be placed in the MIT museum as well as the Student Center. The lounge will also include a plaque for the Class of 2005, whose class gift was used to buy furniture for the lounge.